Macau is fondly referred to as the Las Vegas of China. At night, the city is a glitzy gambling hotspot full of bright lights. By day, you can explore ancient Chinese temples, shop for souvenirs in little boutiques, and enjoy the local Macanese architecture. The city is famous for its nightlife, with an amazing array of casinos (take your online casino guide). There are also some fabulous beaches and the nearby islands of Cotai, Taipa and Coloane are home to some mega casinos, and pretty little villages. What you may not be aware of, however, is the fact that Macau also offers visitors the chance to take part in some adrenaline pumping extreme sports. If this sounds like fun, here are some of the top activities you need to try. The Macau Tower Jump is the world’s highest bungee jump. The bungee platform is 233m high, which is scary enough for a lot of people. Once you jump off, you get to freefall for up to five very long seconds before the bungee cord breaks your descent around 30m from the ground. The system allows you to rebound a few times before you land on a special airbag. This is a seriously hard-core bungee jump, but if you have what it takes, try it when you visit Macau. The Macau Tower Sky Jump is awesome. You take off from the bungee jump platform, but instead of plummeting to the ground in a few seconds, you get to fly for 20 seconds, high above the cityscape. The descent is a bit slower because you are using ‘fan’ technology, so instead of freefalling, you drop at more comfortable speeds of 75km/hr before landing safely. It is a thrilling experience for adrenaline junkies. You may even have time to take a selfie on the way down! The Macau Tower Climb begins from the 61st floor of the tower, which is 233m from the ground. The climb takes you up a further 105m, until you reach the top, which is an impressive 338m up. The climb is up a ladder, but for anyone scared of heights, this is very much an extreme activity. Have you even wanted to walk around a platform high above the ground? 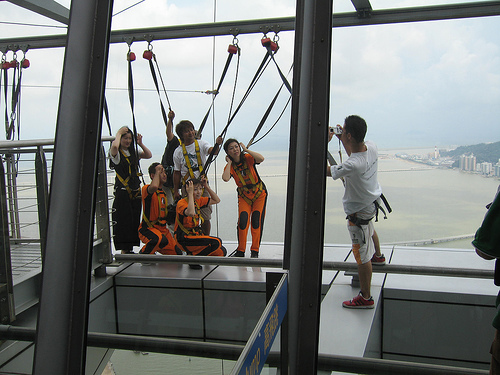 If you book a place on the Macau Tower Skywalk, you can do exactly that. Thanks to an overhead rail system, walkers are securely attached to cables as they walk around the main rim of the platform. You are free to wander to the edge and stare down at the ground, 233m far below. The walk is very nerve wracking if you are uncomfortable with heights, but you are guaranteed some impressive photos for your social media feed. Tickets for all of the above extreme activities in Macau can be bought locally or from your travel agent. Don’t forget to check out the Macau Tower revolving restaurant when you have had enough excitement for one day. This entry was posted in Air Sports, Asia, Bungee Jumping, Travel and tagged Macau. Bookmark the permalink.